Flushed with Rosy Colour: My three year old baby, Bloodlust of Nagrand. I look over all of the craft projects I could do, things started but not finished, and wonder what I might have achieved if I started this in earnest 5 years ago. But I can't begrudge the time I invested in a virtual reality known as Azeroth. I've learnt so much, about myself, my limitations and strengths, and about people generally. Those who don't dabble in MMOs of any kind would be surprised and bemused to know I have to say it's been a life enriching experience! "To wake in the morning with an energy and passion .. makes any cloud seem surmountable and frivolous." Three years ago today, while David was at work, I created my second guild charter on a raven haired rogue named Mary. I had made it the day before on my warlock, Zalise, but decided I wanted the GM to be a toon with an honourable and stately name (years later a young officer would tell me that name was too religious!) I also decided to do it on the 1st of February which would make it an easy to remember birthday. When he got home I said 'Darling, I've made us a guild! We're just waiting for your signature' as I'd easily managed to get 8 other names signed up straight away. 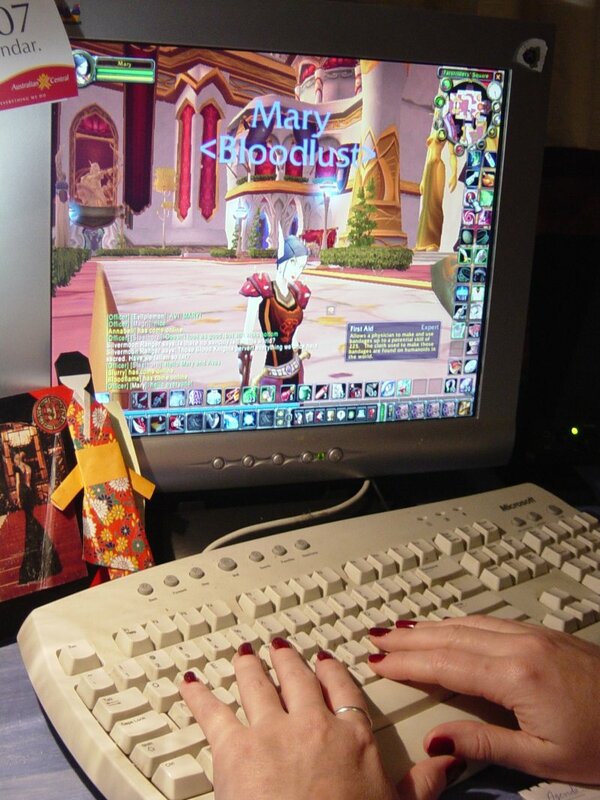 It was called Bloodlust simply because with the launch of the Burning Crusade, I had fallen in love with Blood Elves. I had no idea that it was not an original guild name, we would later find there were many, many guilds called Bloodlust, and ironically it was also the name of Nagrand's battlegroup. Since then, so much has happened, so many trials and tribulations, so many adventures and misadventures! I started out with such different views on the game and the role of players, as it was my first MMO. But the experience of trying to lead a guild has made me make a complete turn around in attitude. It's been very, very hard and now I look back and wonder what the hell was driving me so passionately. The only explanation I can find is that it replaced another great passion of mine, something I full heartedly believed in with all my soul, yet irreplaceably lost. To wake in the morning with an energy and passion for the tasks you are about to undertake that day spurs you on and makes any cloud seem surmountable and frivolous. It's quite an astonishing miracle, that the guild took on this mantle, that I was able to re-devote my attentions so self-assuredly to an abstract concept so that it would survive to this day. I actually gave up on it three months ago and made David's toon the guild leader, a token gesture as I'm still involved with it, but I did it all the same. The passion has died, I no longer know with complete confidence what is best for the guild, to have that spirit and energy to virtually fight with other personalities that would interfere and take advantage of our work and take it for their own. It is a very abstract concept, and now the fire to fight is hard to find within me. But for the guys that are left, as long as they are happy with the direction it goes now, I'm content we've had fun with it and it achieved something great. Now I am a passenger on a ship I built, I give myself up to trust and the gentle rocking of waves not of my own making! Happy Birthday, Bloodlust of Nagrand, my amazing baby, may you continue to grow without me holding your hand wherever you go!